Over three-quarters of Czech citizens (78 %) are currently satisfied with their lives. A two-thirds majority of people (69 %) considered 2016 to be a successful year for them personally. More than half the population (53 %) looked on the past year as a success in terms of society as a whole. In addition to these positive findings, the survey also found that half the respondents chose positive statements to describe their feelings (wellbeing, happiness, everything is as it should be, everything is going well). One third of citizens have a negative perspective on life and the past year. 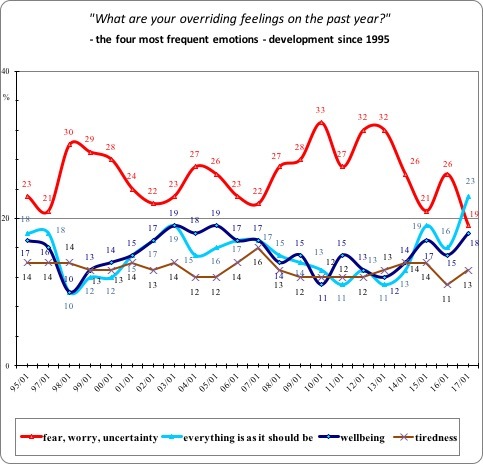 Compared to last year’s survey, there has been a significant change in the mood of society, with the proportion of positive emotions increasing by 10% and negative emotions decreasing by 12%. The beginning of the year is often associated with looking back and assessing the year just gone by. Since 1994, STEM has been regularly asking people in its January survey how generally satisfied they are with their lives and how they would evaluate the past year from a personal perspective and in terms of development in society. According to this survey, more than three-quarters of citizens are currently satisfied with their lives. Looking back at 2016, an over two-thirds majority of respondents consider the year to have been a personal success. People are not quite as positive in their assessment of society as a whole, though. Nonetheless, more than half the population believes that 2016 saw positive developments in society. In their assessment of justice and fairness in society, people are even less enthusiastic; almost three-quarters do not believe that last year brought more justice and fairness to society. According to the January survey, personal satisfaction with life and with the past year has remained at a high level. Since our January 2015 survey, we have recorded a gradual, albeit slight, increase in optimism among the population. 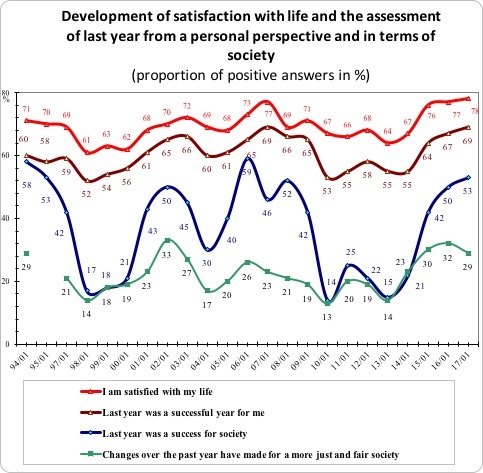 The current survey indicates that even in terms of personal satisfaction with life, the proportion of those who are satisfied is at a historical high since 1994 when STEM started conducting its long-term series of surveys. Similarly, since 2015 we have also seen an improvement in the population’s assessment of the state of society in terms of general wellbeing. Their assessment of justice and fairness in society has been relatively stable in recent years, at in around the 30% mark. It appears that the period of negative assessments, characteristic of the years 2010-2014 (particularly in terms of what was going on in society at large), is definitively behind us. The survey found that younger people, the better-educated, the better-off and right-wing and centrist party supporters expressed higher levels of satisfaction with their lives and the past year than other groups in society. By contrast, the over 60s, those with a primary education and worse-off households are less likely to be satisfied. There were no significant differences between the various socio-demographic groups in terms of satisfaction with the development of society as a whole. Part of STEM’s beginning of year survey is to ask citizens to give their assessment of the past year in terms of the emotions they associate with it. Respondents were given ten options to choose from. Overall, the results indicated that half the population (50 %) felt positive about the year. They believed that everything is as it should be, everything is going well, and their feeling was one of wellbeing and happiness. By contrast, one third of respondents (33 %) expressed negative emotions such as worry, restlessness, helplessness and anger. Compared to last year’s survey, the proportion of people with a positive mindset has increased by 10 percentage points and those with a negative mindset had decreased by 12%. Among the remaining respondents (17 %) the predominant feeling was one of fatigue and boredom in their assessment of 2016. The statement most frequently chosen by respondents to describe last year was “everything is as it should be” (23 %). This proportion represents a historical high. By contrast, feelings of fear, worry and uncertainty have fallen to 19 %, representing a historical minimum.